As we mentioned last time, in 2017 only 1 of the 70 asset classes Deutsche Bank tracks closed in negative territory despite many being inversely correlated – clearly a market behaving oddly. As of mid-November, 90% were in the red for 2018 as the overexuberance of 2017 is forced to pay the piper. In 2017 44 of the 47 country stocks in the global MSCI index closed up for the year. As of the December 11thclosing, only 3 are in the green. Market dynamics are reflecting the increase in macro/political volatility across much of the world, but the headlines have yet to catch up with the primary drivers underlying the deep changes. In our previous Context & Perspectives piece, I discussed how we are seeing a profound decline in the level of liquidity at a time when debt levels are back to record highs. This week is a highlight reel of warning signs in the context those record levels of debt. Last Friday’s Nonfarm payrolls were significantly below expectations at +155k versus expectations closer to +200k on top of downward revisions of 12k to the prior two months. That’s not great, but amidst all the hype around this being a phenomenally strong economy, the workweek shrunk to a 14-month low of 34.4 hours from 34.5 in October. That translated effectively into 370k jobs lost, which means that the real picture for employment was a net loss of -215k (+155k new payroll -370k from shortened work week). The -0.2% decline in aggregate hours worked, the second decline in the past three months, means that unless there was a big jump in productivity, output, aka real economic activity, contracted for the month. We also saw a decline in earnings with average weekly income falling -0.1% given the decline in the average workweek and an increase of hourly earnings of +0.2% versus +0.3% expected. This is the first decline in weekly earnings in 2018 and may call into question the expectations around Christmas shopping. 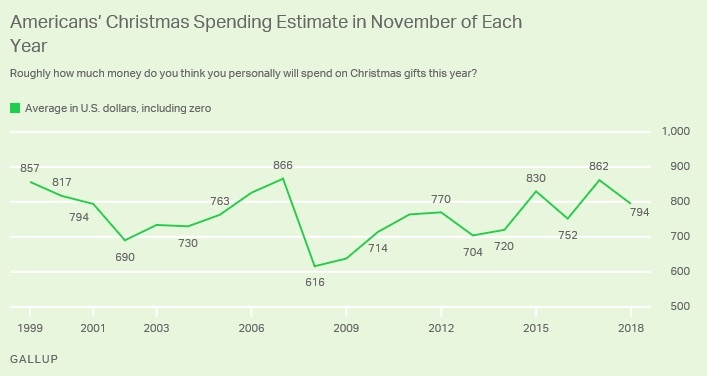 The recent University of Michigan Consumer Sentiment survey found that an increasing number of respondents are expecting unemployment to be higher in the next twelve months than lower and a recent Gallup poll found that Americans plan to spend less on holiday gifts today than they expected back in October and less than they expected to spend in 2017. The $91 decline in expected spending since October is, “one of the steeper mid-season declines, exceeded only by a $185 drop that occurred in 2008, as the Wall Street financial crisis was unfolding, and a $102 drop in 2009 during the 2007-2009 recession.” The environment is changing. Putting it all together, last month saw a contraction in the workweek, in the index of aggregate hours worked and in average weekly earnings – not exactly a story of a robust economy despite the headline 3.1% year-over-year rise in average hourly earnings, the strongest read since 2009. Digging into the details can give a different picture.